INDIANAPOLIS — Regenstrief Institute investigator Thomas F. Imperiale, M.D., has been named the inaugural Lawrence Lumeng Professor in Gastroenterology and Hepatology at Indiana University School of Medicine. Dr. Imperiale is an internationally respected health services researcher and a clinical gastroenterologist. Dr. Imperiale’s research, which has been funded by the National Cancer Institute, the National Institute of Diabetes and Digestive and Kidney Diseases, the Department of Veterans Affairs and other organizations, focuses on developing and testing screening strategies for colorectal cancer based on risk factors. His findings have been published in highly regarded journals including the New England Journal of Medicine, Journal of the American Medical Association, Annals of Internal Medicine and Gastroenterology. 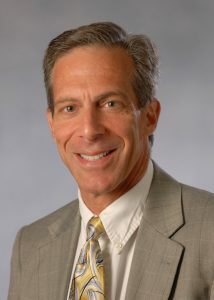 In addition to the IU School of Medicine, Dr. Imperiale holds appointments with the Regenstrief Institute’s William M. Tierney Center for Health Services Research, the IU Center for Health Services and Outcomes Research, the VA Center for Health Information and the Indiana University Melvin and Bren Simon Cancer Center. The new endowed professorship is named for Lawrence Lumeng, M.D., who was the Division Director of Gastroenterology and Hepatology in the Department of Medicine at the IU School of Medicine from 1983 to 2007. Under Dr. Lumeng’s leadership, the division pursued excellence in patient care and innovation in research and education. Dr. Imperiale is a graduate of City University of New York, earned his medical degree at New York University, was a resident in internal medicine at Case Western Reserve University and completed fellowships in clinical epidemiology at Yale University and in gastroenterology at Case Western Reserve University. Since joining IU in 1996 and the Regenstrief Institute in 2000 he has mentored more than thirty medical residents, fellows and junior faculty members. He is a recipient of the Regenstrief Institute’s Outstanding Investigator Award and the IU Trustee Teaching Award.